Four summers ago our church began a summer reading program for children and their families (well, actually for anyone interested). The idea was to read the New Testament during the summer months as a family. At the time Annelise was almost three years old and probably could have sat and listened while we read out loud, yet we did not participate that year. We mistakenly thought she was too young . Yes, I kicked myself over those silly thoughts. The next summer we signed up and read Psalms and Proverbs out loud each day (well, sometimes we had to play catch-up) and sang a few bible memory songs. Each time Annelise read 10 chapters she received a little prize (the prizes got a little bigger with each level) and moved her rocket up on the chart (the theme was Blast Off With God's Word). Having this small incentive kept her interested and motivated. 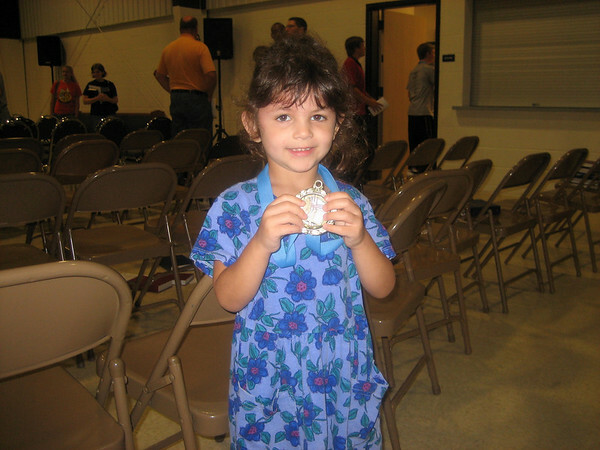 At the end of the summer she received a certificate, a medal and got to go the ice cream party. She was quite pleased with herself, as were we. Did she relate to or understand very much of Psalms and Proverbs? Probably not. The most important thing was she was exposed to listening to God's Word read directly from the Bible each day and saw her family make doing so part of her routine and saw that it was a priority. Since we also practiced memory songs after our readings, Annelise learned to sing the 66 books of the Bible by the end of the summer! Last summer we were Wild About God's Word and we read the four Gospels. 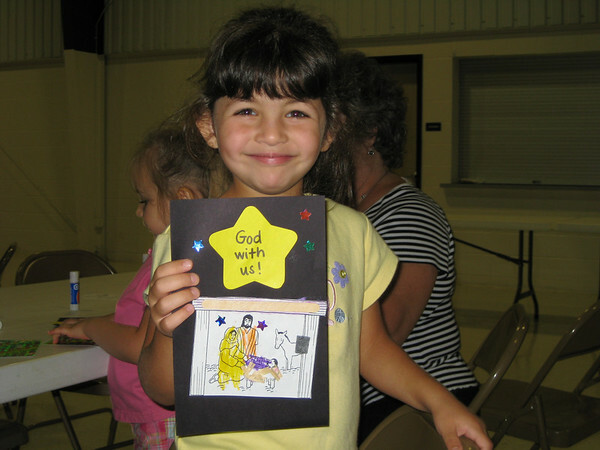 Something new was incorporated into the program, a weekly Bible Power Hour which consisted of a bible story, singing, a puppet show, craft and snack. This was a HUGE hit on many levels since it reinforced the daily family readings, was open to the community (there were several steady visitors each week, some of the boys and girls also invited their friends from school or neighborhood), it was fun for the kids and it was something we easily fit into our weekly summer routine--in fact it gave us a bit of a routine. 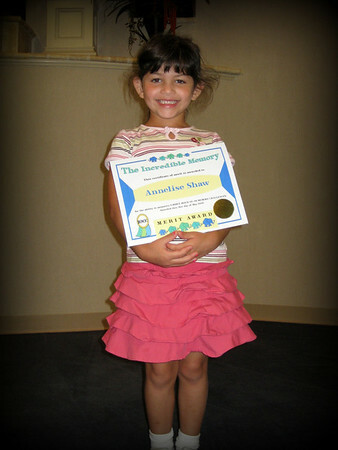 Here is a picture of Annelise and one of the crafts she made last summer. 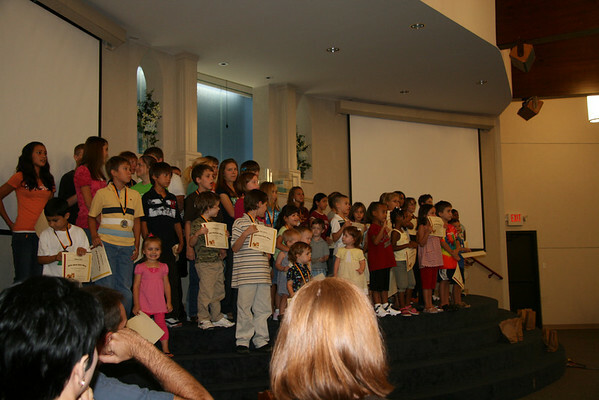 At the end of the summer there was an awards ceremony where the boys and girls that completed the program received a medal and a certificate. Oh, yeah...there was ice cream too. Annelise was pleased as punch to get another medal! This summer we are reading Genesis and Exodus as a family. Bible Power Hour started last week and Annelise couldn't wait! She decided she would skip school that day so she wouldn't miss out. Over the past few summers I have learned how important it is to read the Bible together as a family. That has always been one of our goals, yet not one we practiced regularly. I learned children are really never too young to listen to God's word, directly from the Bible (still regret missing the first summer reading challenge, kick me). At the end of each summer I am so fired up I want the daily readings to continue, but without a set schedule we get lazy. Sigh. 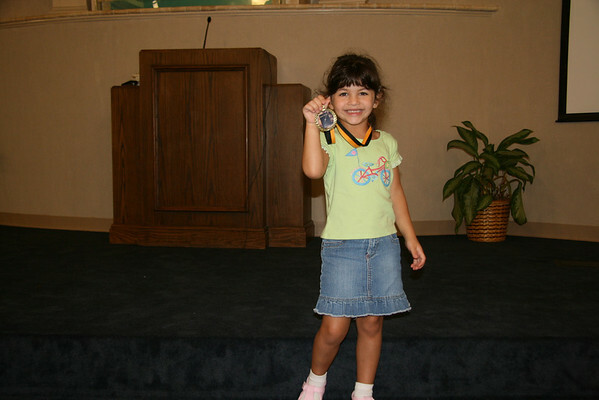 Annelise recently received a certificate for completing all nine memory work songs used in our regular children's bible hour. It's amazing what can be memorized when it's put into song! Along with the books of the bible they learn the Judges, the Sons of Jacob, the Ten Commandments, The Apostles, the Fruit of the Spirit to name a few. Or maybe more than a few. She was beaming with pride--and so were we! Way to go Annelise! What an awesome summer activity. Proud of you little girl! we have started the Summer Reading Club this summer too! Yes, I will answer to the name Dorothy! Though, one tornado is enough for me!!! That is SO great! Awesome work, MOM!!! Just today at church, the teacher was talking about those daily things like prayer and scripture reading and how they are like filling our lamps. You can't pour oil into your lamp. It has to be put in drop by drop. In our spiritual lamps, we have to do those little things every day to fill ourselves and get the blessings. SO important. Thanks for the great reminder again. What a wonderful summer activity!! Amen!!! BPH rocks!!! ANd the SRCis such a good way to start a habit! Good for you! What a great thing for Annelise. Way to get in a good habit of doing the things that matter most. what a great thing for the summer! and i agree- they may not get the meaning, but you're establishing an important habit and they get more than we think out of it. kellen has been asking me to read the scriptures to him lately- and while we RARELY make it more than a chapter, he's intently interested in a really funny way. i think children are more sensitive to spiritual things than we are sometimes...and they recognize that sense of the sacred and spiritual far more often than we realize. It's so great that your family does this! I made the mistake of thinking our kids were too young, but now know that they're never too young. We have 3 years olds at church who know all the answers to the questions we ask them about scripture stories because their families read and teach them regularly.